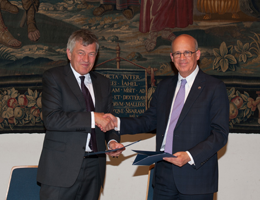 Tel Aviv University (TAU) and LMU have signed a Memorandum of Understanding in relation to the LMU-TAU Research Cooperation Program. TAU’s President Professor Joseph Klafter, and its Rector Professor Yaron Oz both made the journey to LMU for the formal signing of the agreement and inspected various University facilities. The planned strategic collaboration, which is financed jointly by both institutions, has been officially designated as the LMU-TAU Research Cooperation Program. Its goal is to strengthen cooperation between the partners in all areas of research by undertaking joint projects, organizing scientific workshops and stimulating interaction and exchange between specialists from both universities. LMU has, for example, agreed to establish a Visiting Professorship specifically for faculty from TAU. Professor Dieter Lüst of the Faculty of Physics will serve as LMU‘s Coordinator for the LMU-TAU Research Cooperation Program.